The Flowermate V5s is a portable dry herb vaporizer that hit the market early 2015. 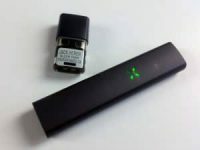 It replaced the Flowermate V5, which was a very popular and successful weed vape in 2014. The previous version was a good vape, but the silicon mouthpiece was terrible and battery life wasn’t great. 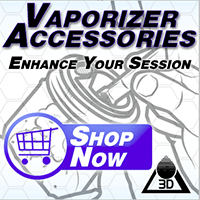 The 5.0s made drastic improvements and has earned a position on our best budget vapes list!. The 5.0s uses a small ceramic oven and comes equipped with a glass mouthpiece. The outer shell of the Flowermate 5.0s vaporizer is a durable anodized aluminum that’s available in black or blue. The glass/pyrex mouthpiece screws into the body directly above the heating chamber when in use. When not in use, the mouthpiece can be stored in the bottom of the unit. 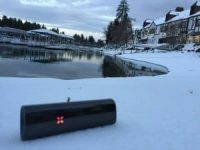 Both the top and bottom of the vaporizer has sliding plastic ‘doors’ to cover the storage chamber and the heating chamber. The oven, or bowl, holds up to .5g if you pack it on the tighter side, but functions much better with .1g. A pen cap, or a sharpie cap makes the perfect scoop for loading material. A light and fluffy grind works best, but if your greens are on the dry side go with a courser grind. The screen is built into the mouthpiece and its a pretty fine screen. Too fine of a grind, or pulling too hard will pull material into the screen and clog it up. I removed the fine screen in the mouthpiece and replaced with a standard stainless steel screen. It’s a MUCH better experience this way. I also toss another stainless screen on top of the oven for good measure (and easier cleanout). The device is controlled with a single button on the side of the unit. Tap 5 times to turn it on or off. Sometimes this can get tricky, especially as your device gets older and the button gets looser. Mine’s been used daily for more than a year, no major problems. I just click 6 times for good measure. The temp settings on the Flowermate 5s are nice and simple. It turns on to Blue, which is a pretty low temp of 385. You won’t get giant clouds here, but this temp activates the lower range of cannabinoids to produce a GREAT daytime sativa high. Perfect for remaining functional. Hold down the button for 2 seconds and the color changes from blue to purple. The light will flash as oven rises to 400. The light will stop flashing when the temp is achieved. This temp will give more of the Euphoria sensation for most strains. I prefer this temp for indicas and will usually vape 2 or 3 five minute sessions on a single bowl. Hold down again for Red, which is 415 degrees. Starting a fresh bowl here gives a pretty deep high, closer to smoking. I usually only hit the red after two sessions on purple. I’ve checked the temps a few times with an instant thermometer, they were surprisingly accurate. The battery life of the Flowermate 5.0s is very good. It takes a couple hours to fully charge, and that charge will last 12-15 five minute sessions, or 7-10 ten minute sessions. With daily use at 2 or 3 sessions per day, the battery will get you through most of the week. After a year of daily use, my Flowermate 5.0s gets charged on Sunday and Friday. The battery is technically not user replaceable; however, it’s very easy to do. Mine is equipped with Samsung 18650 (3.7v 2500mAh) You’ll get more sessions per charge if you’re using the lower temperature settings. The Flowermate 5.0s is a great vape for occasional or even daily users.